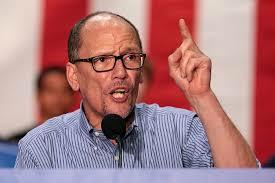 Ever since Tom Perez barely beat Congressman Keith Ellison for the Chairmanship of the Democratic National Committee, he’s bumbled from one public relations crisis to another. Fundraising is perhaps the most important job of a party committee, and now The Hill reports that Perez’s bungling extends to that as well. If Perez keeps doing as bad of a job as he’s done these first months, he might one day rival Debbie Wasserman Schultz in the annals of worst party chairperson ever.